Is this another movie universe incoming? Edgar Wright, Rian Johnson, Dwayne Johnson and Lin-Manuel Miranda have joined forces over social media to plot a potential Simon and Garfunkell movie universe. 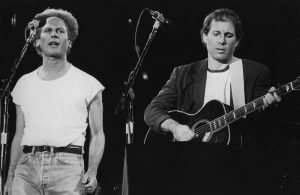 Disney are taking the lead with shared universes across Marvel and Star Wars, DC are building their universe and now Universal have announced their monster universe – it makes sense that there’s a universe to be made out of the discography of Paul Simon and Art Garfunkel. What began as a joke on Twitter from Hot Fuzz director Edgar Wright spiralled into a fully fleshed movie pitch featuring some famous friends, Variety reports. Wright’s new driver-action movie takes its title from a Simon and Garfunkel track – just in case you were missing something. Star Wars director Rian Johnson chimed in, followed by Hamilton’s Lin-Manuel Miranda. Marc Webb then joked that his movie “I Am The Rock” would star Dwayne ‘The Rock’ Johnson to which the Baywatch actor responded “If you’re in then I’m in E-dub”. Edgar Wright’s Baby Driver stars Ansel Elgort, Kevin Spacey, Jamie Fox, Jon Hamm, Jon Bernthal and Red Hot Chili Peppers bassist Flea. he film tells the story of getaway driver Baby (played by Ansel Elgort), who constantly listens to music to focus following a car accident when he was young. Baby becomes embroiled in the crime world and attempts to drive his way out of involvement. Baby Driver is available in cinemas from June 28. The post Edgar Wright, Dwayne Johnson and Star Wars’ Rian Johnson plan Simon and Garfunkel movie universe appeared first on NME. Star Wars Episode 8 – The Last Jedi: release date, trailers, cast, and everything we know so far Watch Harrison Ford say he’s “not really” looking forward to Han Solo movie Westworld’s Thandie Newton could be joining ‘Han Solo’ movie ‘The Last Jedi’ director endorses The Mountain Goats’ Star Wars song Disney boss Bob Iger ‘views early cut’ of ‘Star Wars: The Last Jedi’ JJ Abrams gives verdict on ‘Star Wars’ Han Solo film script Watch JJ Abrams, Chris Pratt and Penelope Cruz demand ‘Star Wars: The Last Jedi’ spoilers from Daisy Ridley ‘The Wire”s Michael K. Williams in talks to join Han Solo spin-off movie New ‘Star Wars: The Last Jedi’ merch introduces new-look Rey Is ‘Jedi’ in ‘Star Wars: The Last Jedi’ title plural? Watch Kevin Spacey star as a crime boss in the trailer for Edgar Wright’s new film ‘Baby Driver’ Rian Johnson reveals that Rey’s parentage will be ‘addressed’ in ‘Star Wars: The Last Jedi’ Director Rian Johnson says there will be no allusions to Donald Trump in ‘Star Wars: The Last Jedi’ Dwayne ‘The Rock’ Johnson and Vin Diesel ‘sign up’ for another ‘Fast And Furious’ movie Watch Dwayne ‘The Rock’ Johnson talk about running to be President Dwayne ‘The Rock’ Johnson announces his Presidential bid with running mate Tom Hanks Dwayne ‘The Rock’ Johnson recreates classic ’90s turtleneck photo ‘Guardians Of The Galaxy’ star Micheal Rooker wants ‘The Walking Dead’ actor Norman Reedus to join Marvel universe Man found guilty of burgling Simon Cowell’s home while security guard used toilet ‘Fleabag’ star Phoebe Waller-Bridge to star in new ‘Star Wars’ Han Solo spin-off movie?